Most universities make use of e-learning facilities to manage and deliver on-line learning. Many universities have adopted an approach to teaching and the delivery of course content that combines traditional face-to-face delivery with online teaching resources: a blended learning approach. Many factors act to determine how online learning is adopted, accepted, and the balance between online and face-to-face delivery is formed. In this paper, the authors suggest that educational technology adoption decisions are made at three levels: strategic decisions are made by the university to implement a particular package, and then individual academics made adoption decisions regarding those aspects of the package they will use in their teaching and how they will use them. They also make a decision on the balance they will have between on-line and face-to-face teaching. This article questions how decisions are made to adopt one e-learning package rather than another. The authors then examine how individual academics relate to this technology once it is adopted and make use of it to deliver some or all of their teaching and determine the appropriate blend. Recognition that traditional methods are unable to address the need for higher-order learning experiences and outcomes demanded by a changing knowledge and communication-based society. A university in Melbourne, in common with many other universities around the world, is making good use of various aspects of e-learning. 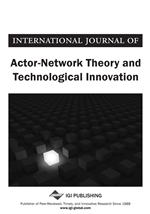 By its nature, e-learning involves interactions of technology and people and so actor-network theory provides an appropriate frame for investigating its use. This paper examines several uses of e-learning technologies and the politics of their use at this university. Some years ago the university took a strategic decision to adopt WebCT as its primary e-Learning platform, and undertook a number of strategies to encourage use of this technology. As most academics will know, the WebCT e-learning platform offers facilities for the management of e-learning including discussion boards, results/mark book, an e-mail system, live chat, and support for student downloading of content including documents and PowerPoint presentations. At this university, the extent to which each of these facilities have been adopted and used varies considerably from one course to another. Recently, a meeting of interested academic staff at the university were told that the company that supplies the WebCT product, Blackboard Learning Systems Inc, had indicated that they would soon withdraw support for this product in favour of Blackboard, their main product, and that this would require the university to decide whether to move to Blackboard or to adopt an open source e-learning product such as Moodle. Another strategic decision was thus required, but while the decision to purchase and implement a particular e-learning product by the university would be a strategic one, this decision would not necessarily determine the extent to which each individual academic would make use of it in their teaching. In this university, while there is a general policy requiring academics to make some use of WebCT, decisions on how to make use of it in their own teaching subjects had been left largely up to the lecturer co-ordinating each subject. So, while the overall adoption decision by the university should be considered in terms of strategy, individual adoption decisions to use some aspects of the package but not others are best considered thought the lens of innovation adoption. Adoption, implementation and use of an appropriate e-learning package can thus be looked at as involving a series of decisions made at two different levels: the university level and that of the individual academic. The initial strategic decision by the university to adopt WebCT as an e-learning platform should be considered in terms of strategic decision making. Decisions by individual academic staff on how to use e-learning in their teaching, or whether they will adopt it as an e-learning environment at all should be considered in terms of innovation adoption. The university’s decision to be made in adopting a new e-learning platform to replace WebCT is clearly a strategic one. The decision by academic staff on how they will use this new e-learning platform, how they will balance the blend between on-line and face-to-face teaching, or whether they will adopt it at all, is an innovation adoption decision. This article investigates the strategies and innovation factors behind all these adoption decisions –strategic decisions made by the university administration and adoption decisions made by individual academic staff members.